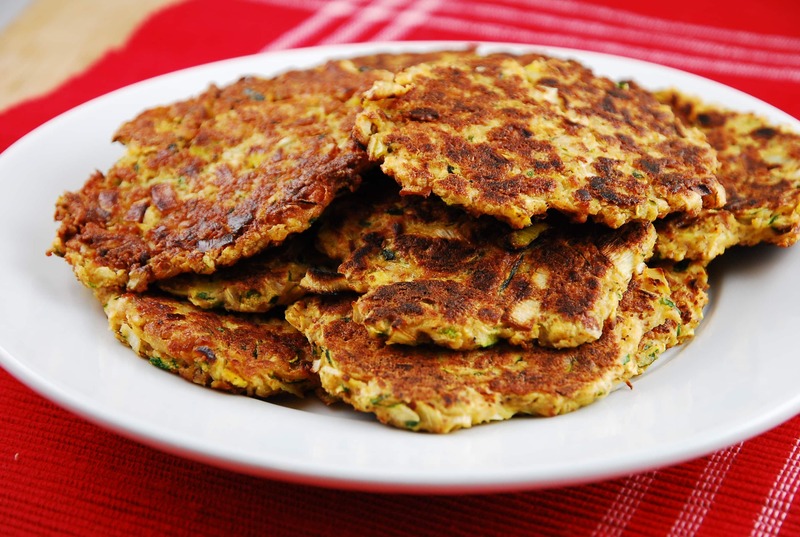 A really good friend of mine, Gali, introduced me to the deliciousness of these Zucchini and Leek Fritters. They are a healthier, lower calorie, lower carb version of potato pancakes, and I am absolutely in love with them. The zucchini shred so much faster than the potatoes, plus, I don’t have to peel the potatoes either, so that makes it a lot easier and quicker to prepare. Sometimes, when making these for the kids, I will use almond meal instead of the panko which is a great way to get in some healthy benefits of almonds. But that will definitely add in some extra Weight Watchers Points, so keep that in mind if you are watching Points. But either way, these Zucchini and Leek fritters get a nice crust on the outside with a soft, chewy inside that is full of flavor. Perfect for a low calorie Hanukkah Latke Recipe too! : Crispy on the outside, moist and chewy on the inside, these low calorie fritters are a great alternative to carb heavy potato pancakes. And they are as delicious as they are light! Place shredded zucchini in a cheesecloth or kitchen towel, and squeeze as much water out as you can. Afterwards, place zucchini in a large bowl. Add in all remaining ingredients and mix well with hands. Place a large, non-stick skillet over medium high heat and mist with an olive oil mister or cooking spray. When pan is heated, scoop out about 1/4 cup of the zucchini mixture and form it into a patty. Place in pan, and repeat until you run out of space in your skillet. Lightly press on zucchini patty to flatten, and cook until browned well, and inside is cooked through (about 4-5 minutes on each side). Repeat in bathes, re-spraying the pan with a light mist of oil each time until all of the mixture is used up.You should be able to make about 12 patties. Can these be made in advance and re-heated? Thanks! Hey there, I made these tonight and over the last few weeks have made quite a few of your recipes over here in Australia. Yummo! Thanks again! Did you try to click on the blue “Save Recipe” button at the end of the recipe (right under the sharing buttons)? By clicking this button you will be able to add the recipe to your box.